Define Control over Your Networks. Custom Build Your Service Applications. WebNMS is an industry-leading framework for building network management applications. With over 25,000 deployments worldwide and in every Tier 1 Carrier, network equipment providers and service providers can customize, extend and rebrand WebNMS Framework as a comprehensive Element Management System (EMS) or Network Management System (NMS). The WebNMS Syslog Monitoring enhances the Fault Management of WebNMS Framework based applications. This takes place by providing the syslog daemon functionality. Applications running on WebNMS Framework can act as a syslog server and receive syslog messages. The WebNMS Systems and Applications Monitoring enables applications running on WebNMS Framework to manage system resources such as CPU, memory, disk utilization, and servers such as database servers, web-servers, ftp servers, etc. The WebNMS Universal Mediation solution offers a comprehensive solution for integrating network elements and element managers with OSS systems. It offers universal and feature rich mediation architecture based on standards, including J2EE, XML and web services. The standards based architecture with open APIs offers developers a high degree of control and extensibility. 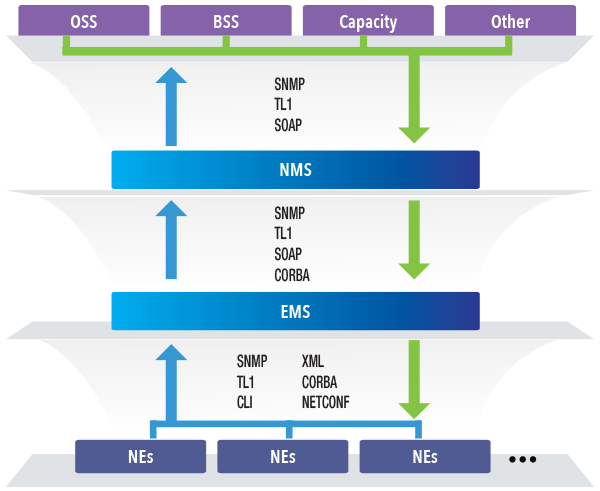 New network elements, EMS/NMS systems and OSSs can be rapidly integrated with minimal development effort.